Another wonderful transformation completed in just one, three-hour appointment. Mallory made an eight hour trip from Arkansas based on the recommendation of her cousin that had the same procedure a year ago. Dr. Trizzino with no anesthetic did 6 chair side veneers. Mallory cried with excitement when looking at her new smile. Dr. Trizzino offers free consults to discuss if the same can be done for you. Linda was just out of braces, and although happy with the results, she wanted to go a step further to improve her smile. She was unhappy with the shape and color of her natural teeth. She has what she considers “a-frame” teeth – narrow at the top and wider at the bottom. 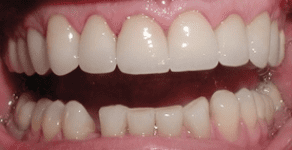 Linda bleached her lower teeth, then Dr. Trizzino placed 10 all-porcelain veneers on the upper arch – She received the youthful, natural pretty smile she had wanted for so long. The entire dental team takes much pride when we can make patients that happy. Ray came in wanting to close the spaces between his anterior teeth and to regain his youthful, healthy smile. 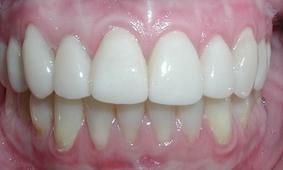 We accomplished this transformation with 9 all-porcelain crowns. Ray also lost 50 pounds, which made the before and after even more striking. For most of her adult life, Peggy had lived with her two front teeth being discolored and tilted backward, never really aware that it might be affecting her smile. 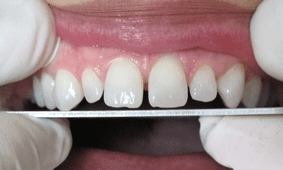 Following a complete cleaning, a resin material was artistically shaped to her tooth. This one-hour treatment has profoundly affected this patient’s self-image. She now realizes that her children were right to insist she do something about it. Peggy is now a tooth showing smiling machine! Wow, look at the difference a day makes! Just one hour after the patient's cleaning, the two central were bonded, resulting in a fresh, more youthful appearance. Tim confessed that he did not like his teeth and would find himself putting his hand in front his mouth when smiling. Poor alignment and old, discolored restorations just didn’t fit this energetic retiree’s image – nor his personality. 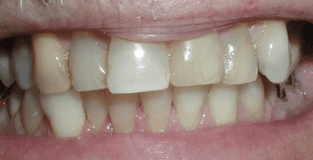 12 porcelain crowns made a very big difference in Tim’s self-image, and his wife is equally as thrilled with the results. She loves her husband’s new, confident smile. After years of grinding her teeth at night, Martha came to us with short, worn-down anterior teeth. 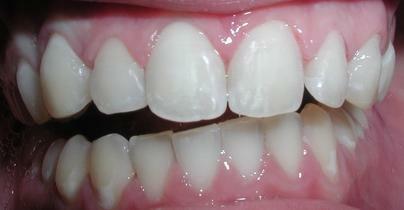 After bleaching and just four all-porcelain crowns, she has regained her natural, youthful smile. Martha tells us that she is extremely happy with her choice to do her crowns instead of a new granite countertop! After three years in braces, the patient had a surprise waiting for him. 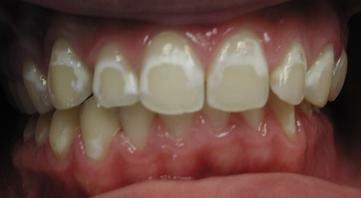 Due to his poor brushing, large amounts of plaque built up on the brackets. 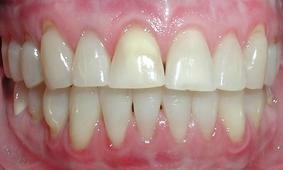 After the brackets were removed, the major decalcification (white areas on teeth) was easily seen. Dan said he was very self-conscious and was careful not to smile. After doing a very conservative removal of damaged enamel, we were able to use tooth color filling material to regain Dan’s natural look - making this young man very happy – ALL in just one visit!